At present the Energy Efficiency Center - Georgia is implemented the project “The energy efficiency program for Georgian communities -energy bus project’’- phase II with the financial support of BP and USAID Georgia “The Energy Bus” Project is focused primarily on rural communities, and its initial goal is to raise awareness of consumers on effective and safe usage of energy, as well as to improve access to renewable energy sources through the energy and resource management information centre on wheels, which serves as a highly effective tool for communicating the best experience in energy efficiency, and alternative energy technology through on-board multi-media interactive displays. As an energy information resource centre with displays and models, the EB shows visitors working models of various renewable energy applications: mini solar plant, solar water heating device, micro wind farm and models of energy efficient stoves, biogas digester, micro hydro plants, see the various energy efficient building and insulation materials, samples of energy efficient lighting etc. Video clips and slides demonstrate practical applications of various alternative energy and energy saving technologies. EB visitors can also get additional information from "how to" brochures, leaflets, get individual consultations on introduction of alternative energy sources and applying energy saving strategies to ensure their wide application and rational energy resource management in the country, contributing to family savings and sound environmental management. 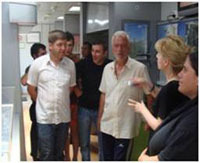 In every visited settlement the EB offers the training session in the local school for both the schoolchildren and the teachers; during such trainings the EEC experts make a presentation specially designed for the schoolchildren, show how to play the “computer games” and then invite the kids to visit and tour the bus. Every visited school receives the full package of brochures, leaflets, posters and CD with short video films and computer games-“Build your own house” and “Change the bulb”. During such sessions the announcement on the competition among the schoolchildren is usually made. Besides in the frame of the project there has been announced the competition among the journalists for the best article or TV spot on RE&EE applications. 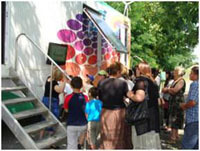 The competitions among the schoolchildren and the journalists will have annual character, the best works will be put on exhibition during the annual National Sustainable Energy/ Energy Bus Day in February 2010 and their authors will receive the awards. Prior to starting visits to the regions, firstly the Energy Bus visited the Tbilisi districts providing its visitors in addition to the bus tour the consultations on Renewable energy sources and energy efficient technologies. 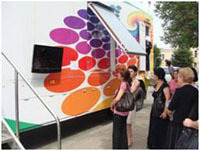 After staying in Tbilisi districts the Energy Bus started visiting the regions. The first visited region was Kakheti. In Kakheti EB visited Sagaredjo, Gurjaani, Sighnakhi, Dedoplistskharo, Lagodekhi, Kvareli, Telavi and Akhmeta districts, opens its doors to visitors in dozens of towns and villages providing thousands of people with information on renewable energy resources. After Kakheti the EB moved to Mtskheta Mtianeti district visiting Stepantsminda, Dusheti and Tianeti districts. Last week the Energy Bus has visited Adigeni, Akhlatsikhe and Borjomi districts. The Energy Bus traveling is continuing throughout Georgia. Another project which is implemented by the Energy Efficiency Center -Georgia with the financial support of the USAID/TESI (The Energy Support Initiative) is “CLEAN ENERGY FOR IDPs”. • To raise awareness among the IDPs on the alternative energy solutions to meet their future demand for energy. The project realization envisages the following: desk study of the existing situation as related to the general situation and energy supply & demand for the IDP settlements, identification of the alternative energy potential for the IDP settlements in the various regions of Georgia, survey for energy needs assessment, analysis of the collected data, identification of various clean energy solutions and market study of identified technologies, cost benefit analysis of the identified technologies, analysis of social advantages of the clean energy solutions as well as their environmental impact. Based on the carried studies development of the feasibility study and recommendations to the Government on the best applicable clean energy solution for the specific locations as well as development of the technical documentation for the procurement and installation of the clean energy equipment on various sites. In addition in order to raise awareness on the clean energy technologies trainings will be provided to the representatives of IDP communities. One more project implemented by the Energy Efficiency Center - Georgia is “Lemniscopter Turbine Driven Micro Hydro Power Unit” supported by USAID/TESI (The Energy Support Initiative) as well. The major goal of the project is to manufacture, carry out site tests and prepare the technical documents of the 3 KW installed capacity micro hydro power unit (“Micro Unit”) driven by turbine with three-sectional unconventional runner (“Lemniscate Turbine”). The novelty of the unit is in the trajectory of the runner blades (wings), which instead of rotating along a circular trajectory, draws the three-dimensional semi-lamniscate ( ) shaped curve. Such trajectory achieved by coupled cone toothed-wheels results in increasing the ‘useful’ part of the blades motion and, respectively, retrivement of the more useful power from kinetic energy of the flow.